New addition to the “Inspired by Outlander” collection. A couple of years ago, we introduced our Inspired by Outlander collection and it came about almost by accident! 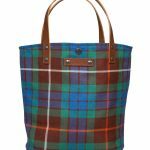 We regularly introduced new tartans to our range of Ailsa tote bags and we were surprised when one new tartan sold much faster than the rest until we realised why. A clue – it was made in Fraser Tartan. If we said the name Jamie Fraser to you, would you work it out? Yes, Dunmore Scotland had been hit by the Outlander effect! 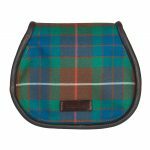 As a result of the demand for this one bag in Fraser tartan, we decided to expand our use of the Fraser plaid to some of our other tartan products. 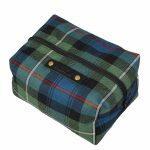 After six months we expanded the range further to include Mackenzie tartan, a beautiful blue/green pattern. 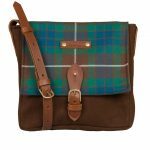 From a small start with three products, our “Inspired by Outlander” collection now has 11 products in the range including the Orkney ladies satchel in Fraser and Mackenzie tartans, the bestselling Ailsa tote in Fraser tartan, scarves in Mackenzie and Fraser tartans and a unisex satchel also in Fraser tartan. 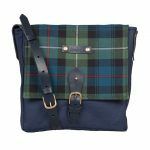 Like every piece in the Dunmore Scotland range, everything in the “Inspired by Outlander” collection is designed and handmade in Scotland, using locally sourced materials where possible. We’ve been delighted to send these pieces to Outlander-lovers across the globe, direct from our base in the Scottish Borders. 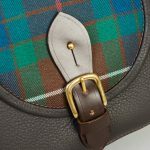 This spring, we welcome a new addition to the collection, an “Inspired by Outlander” version of our signature Strathearn saddlebag. 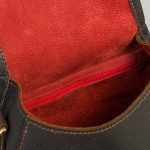 We’ve paired the brown and green toned tartan with brown leather and a cherry red suede interior which picks out the red accent within the tartan. 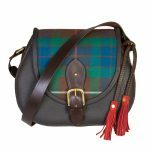 Inspired by Outlander, designed and made in Scotland, carried around the world. This Dunmore bag was a gift for my wife...she has gotten some special compliments on it.